Register with Betfred today and you can claim an easy £30 worth of Betfred free bets when you stake just £10! Betfred has grown dramatically during the past 20 years, it is now the UK’s largest privately owned chain of bookmakers. Originally called Done Bookmakers they rebranded and were renamed in 2005 to coincide with massive online expansion. 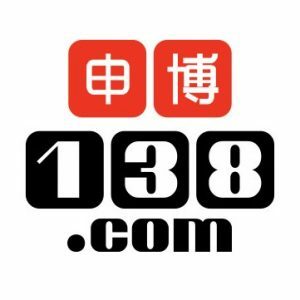 The company are major sponsors of sporting events including the World Snooker Championship, and their name has been associated with numerous major horse and greyhound races in recent years. 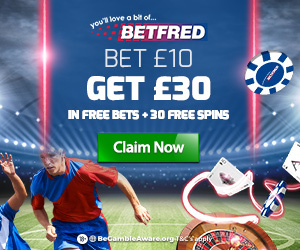 New Customer Betfred Free Bets Offer… Bet £10, Get £30! There are no hidden clauses but do remember your first-time bet must be placed within 30 days of account opening and Betfred free bets will expire with seven days of them being credited. New accounts which are funded via Moneybookers, Ukash, Paysafe and Neteller are excluded from this Betfred free bets offer. Betfred operate 1,370 betting shops and employ 10,000 people in the UK in addition to their online activities which are based in Gibraltar. There’s a mountain of promotions at Betfred including the now commonly embraced ‘Best Odds Guaranteed’ and ‘Cash Out’ options. ‘First Past the Post/Double Result’ is another favourite which comes as standard at Betfred. Enhancements on multiple bets are Betfred’s speciality though. Their ‘Lucky Bonus’ gives 3x the odds for one winner on all Lucky 15’s. 4x the odds for one winner on all Lucky 31’s and 5x the odds for one winner on all Lucky 63’s. Additionally there is also a 10% bonus on all-correct Lucky 15/Yankee bets; 20% bonus on all-correct Lucky 31/Canadian bets and 25% bonus on all-correct Lucky 63/Heinz bets. Football, Rugby, Darts and Golf fans are also well catered for with promotions for all these sports benefiting customers. Constantly changing, the current offers can be found on the Betfred promotions page. Not the best but very strong. That’s the best way to explain the variety of betting opportunities Betfred. There are ‘match-bets’ galore, ‘without the favourite’, ‘place betting’ and even ‘insurance betting’ for horseracing punters. Dog racing is not so well catered for with only traditional ‘win’, ‘each-way’, ‘forecast’ and ‘tricast’ bets on races with the occasional ‘trap challenges’. But, as with most of the majors, Betfred don’t miss a trick when it comes to football and Golf. The most notable thing about Betfred is their tie-in with the Tote and ability to bet within it from Betfred’s site., unsurprisingly really as Betfred bought the Tote in 2011 for £265 million. This means punters can also play the immensely popular Scoop 6 via Betfred’s site and, remarkably, some Betfred promotions give punters who places Tote bets via their site, cash-back. Betfred’s mobile offering is as every part wholesome as what clients accessing their site via PC can expect with all markets available to them. They have also recently introduced a new ‘Voice Bet’ app which, courtesy of voice recognition, accepts wagers in an automated fashion. Betfred closed their call centres in December 2015 and they are yet to offer a ‘Text Betting’ service. Another firm that prominently promotes their ‘Live Chat’ service we were left a little disappointed by the time we were left queuing when compiling this review. Betfred’s telephone lines (one from the UK one from outside of it) and their four dedicated email addresses are the other ways of contacting Betfred with enquiries. Whilst seemingly simplistic and limited Betfred’s accepted payment methods cover major bases, namely: PayPal, VisaElectron, Maestro, Skrill, Neteller, Paysafe, and Paypal. Furthermore customers can deposit and withdraw cash at their local Betfred betting shop. While user friendly and well-designed there’s a lot missing from Betfred’s online site and, in some instances, away from it. For example the closure of the tele-betting service is a disappointment from a company of Betfred’s size and stature. Yes, plenty of markets are on offer but depth is missing. ‘Politics’ and ‘Specials’ betting markets are sparse whilst even the most popular genres should really have a few more bet options related to them. Negating those disappointments is a very attractive sign-up bonus offer, great promotions, price boosts and that all-important ability to back directly into Tote pools. And once a Betfred customer you can avail of a loyalty/VIP program which has some attractive rewards.